In a stock pot add the water and butter nut squash. Bring to boil and cook for 10 minutes, until squash is tender. Remover squash and 1 cup water and place in blender. Add 1 cup cooked beans and blend until smooth. Set aside. In a frying pan over medium heat melt the coconut oil. Add the onions, garlic and red pepper and Fajita Spice mix, saute until tender and golden. Add the chicken stalk to the pureed squash and blended mixture and bring to a boil. Add in the carrots, zucchini, and sauteed mixture. Boil for 5 minutes. Reduce heat and simmer. Simmer until veggies are tender, about 10 minutes. If desired dice chicken and add it to the pot. Stir in tomatoes, spinach, cilantro, and remaining beans and simmer 10 minutes. 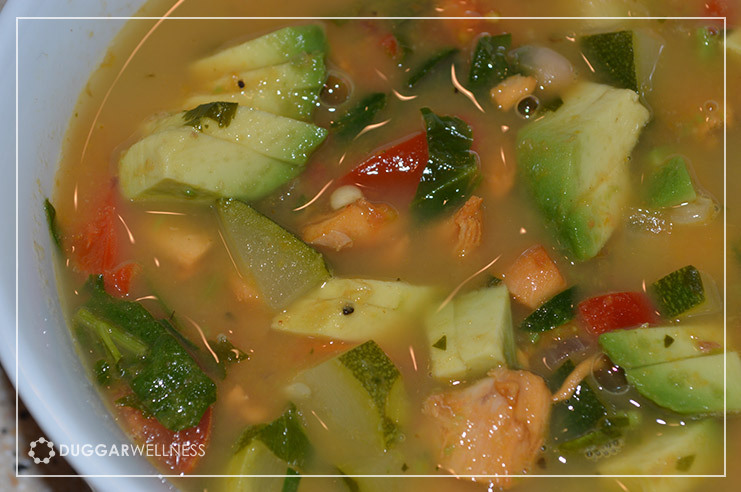 Stir in lime juice and serve garnished with diced avocado.